Door closers have been around for many years. From overhead arms to floor-mounted springs, they are used for a wide range of applications and purposes. Door closers ensure fire doors and security doors always return to the shut position. They are used to help with energy efficiency in buildings by conserving heat within an enclosed space. They also counter draughts and prevent doors slamming. Yet traditional door closer designs are not without their disadvantages. The standard overhead arm design is conspicuous and lacks aesthetic appeal. They add resistance which makes heavier doors harder to open. Both of these factors have lead to door closers mostly being used in commercial settings, on heavy duty interior and exterior doors. Drawing on our decades of expertise in soft close technology, Sugatsune has pioneered an alternative concept which is suitable for the majority of internal door in domestic as well as commercial settings. From doors in your home to wardrobes, our innovative range of soft close door dampers take the precision and control of our patented Lapcon damper technology - as featured in our premium kitchen cabinet hinge mechanisms - and applies it to larger, heavier doors weighing anything between 15kg and 100kg. Unlike door closers, dampers do not control the motion of a door throughout its opening and closing arc. Nor is their primary purpose to ensure a door is always closed. Instead, door dampers make use of a catch system, slowing the swing 5o to 15o from closure. This means that doors are free to operate normally, without extra resistance, while still coming to a smooth, controlled finish when they close. The LDD-S is a discreet soft close damper ideal for internal doors. 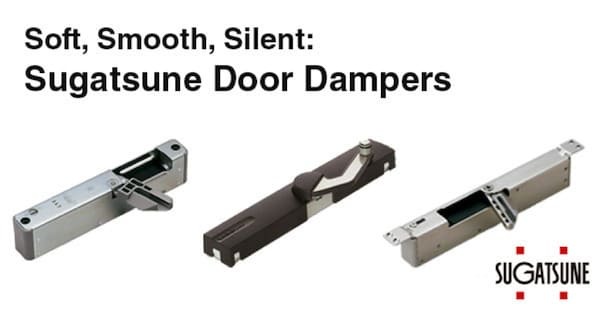 The Sugatsune LDD range of soft door dampers offers a premium solution ideal for anyone who desires soft, silent closure for their doors. Aesthetically, the late catch point mechanism means our soft door dampers can be much smaller and more discreet than standard door closers. The LDD-S surface mount damper, for example, is just 200mm high and sits neatly on the frame of any door. For complete discretion, the LDD-V is a concealed damper mounted into the frame itself so it is not visible at all when the door is closed. The award-winning LDD-V100, meanwhile, extends this concept to doors weighing up to 100kg, not only making soft closure available to the most heavy duty internal doors, but also prioritising a neat, tidy appearance. Our LDD dampers are ideally paired with our HES3D range of architectural hinges, which combine strength and durability with impeccably smooth motion and convenient, adjustable mounting. The LDD V100 can be combined with HES3D concealed hinges to provide smooth, soft closure on heavy interior doors while keeping the mechanisms concealed. One other benefit of our soft close damper system is that the catch mechanism also serves to hold the door in place like a latch when it is closed. On internal doors, this means there is no longer a need to also have a traditional handle-operated latch in the centre of the door. This proves popular with customers seeking to achieve a sleek minimalist effect with their interior design, providing the option to have very small handles or even no handle at all whilst still getting the benefit of a latch to keep a door closed. 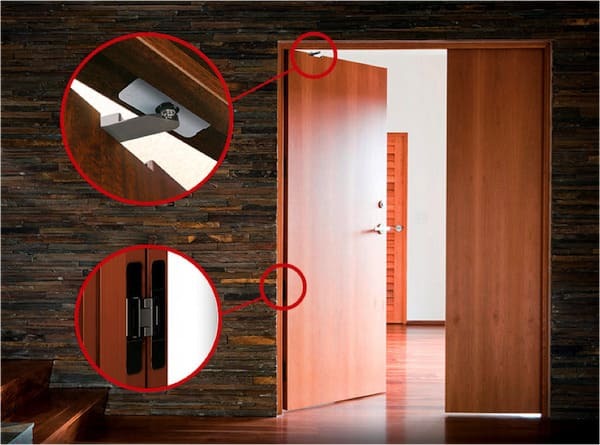 In our latest innovation with door damper solutions, Sugatsune has now introduced a new product which extends these capabilities to wardrobe, cupboard and large cabinet doors. 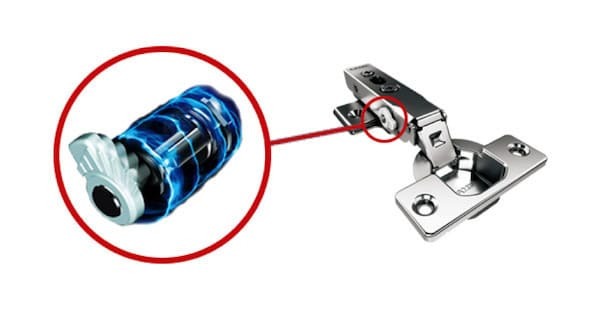 As noted, we have already led the way with soft close technology for kitchen and other light cabinet doors weighing up to 10kg by integrating our Lapcon damper mechanisms into our Olympia 360 concealed hinges. Yet wardrobe and cupboard doors can be anything up to 3m in height and weigh as much as 40kg. Until now, there has not been a dedicated soft close solution suitable for cabinet doors of this size. The Lapcon rotary damper; the innovative adjustable mechanism at the heart of many Sugatsune soft close solutions. The DC-200 plugs this gap in the market by providing combined damper and catch functions for wardrobe and cupboard doors. Unlike the LDD-S, it is mounted on the interior of the cabinet simply by aligning with the adjacent wall, with a catch fitted to the inside of the door. The mechanism serves a dual purpose - controlling the motion of the door to ensure a smooth, soft closure and holding doors closed on a latch. Paired with J95 concealed cabinet hinges, the DC-200 extends premium soft close functionality to large cupboard doors and wardrobes. The DC-200 complements the J95, our heavy duty concealed hinge concept designed specifically for large cabinet doors. The J95 was developed to make all the benefits of our precision engineered small cabinet concealed hinges available for larger doors. Three J95 hinges are capable of holding a door of up to 40kg. Now, with the DC-200, we have completed the circle by making our premium damper and catch technology available to this same market. Copyright © 2019 Sugatsune Kogyo UK Ltd, All rights reserved.